I get this question quite often. My first teacher, Michael Christianson, first showed me this diagram in an old book, and was I immediately struck by its succinct illustration of the tenants of polishing. I adopted it as the logo about 1999. The original illustration from the book was edited for simplification as a logo by my friend, Keith Larman. The book Sword and Same was a compilation of two Edo period books translated by Henri Joly and Inada Hogitaro. The first was originally written by Arai Hakuseki around the beginning of the 17th century detailing the characteristics, science, and manufacture process of the sword blade and the other, by Inaba Tsurio, describing details surrounding “samegawa” (sah-meh ga-wa), or stingray skin that was used in the construction of sword handles and, occasionally, as a decorative and strengthening element on scabbards. 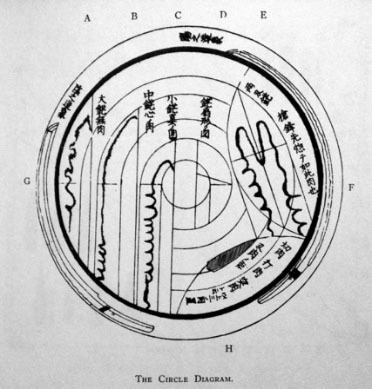 In the book on sword manufacture, this diagram along with another, demonstrates the character of the Japanese sword as a series of harmonious concentric radii. Each curve must balance with its adjacent one to bring balance and symmetry to the overall shape. Additionally, the cutting tip or “boshi” must also have a balance in shape and dimension that itself is as complex as an individual sword and the hamon should also be of balanced width and proportion in the sword. The top three most important elements for a Japanese sword are the shape, the shape, and yes, again the shape. First, the iconic shape, defines the Japanese sword by design and construction. Second, the shape defines the period in which it was made and thus serves as a marker in time. Third, the shape illustrates the health of the blade in tandem with the period. The polisher's objective is not only to repair the sword, but to maintain it in such a manner as to preserve its overall shape while doing so. This can only be achieved with an approach to remember conservation first, removing as little metal as minimally possible. On this path, the polisher must also maintain and refine the shape in the very first stone. This diagram serves as a visual illustration of the mission a smith has in creating a sword, and the polisher has in maintaining the shape the smith created.